The majority of the Ukrainians continues to eat at home. Over the past month, 30% of the adult population (51% among people under 40 years, only 17% among the people aged over 40 years) consumed food that was prepared outside the home. Residents of Ukraine prefer "democratic” catering establishments. 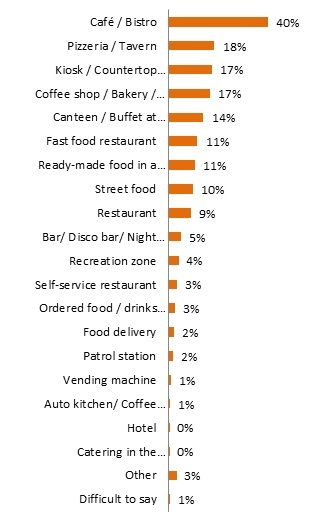 The leaders are cafe or bistro, that account for 40% of recent visits, only 9% of the population visit restaurants. On February 09-18. 2018. Kyiv International Institute of Sociology (KIIS) conducted an all-Ukrainian public opinion poll. Data were collected from 2043 respondents living in 110 settlements in all oblasts of Ukraine (except for the AR of Crimea) with the method of personal interviewing. The sample was stochastic, and it is representative of the population of Ukraine aged 18 and above. In Luhansk and Donetsk oblasts survey was conducted only in the territories that are controlled by the Ukrainian government. The pace of modern life makes people delegate cooking to professionals and increasingly carry food consumption out of their homes. The focus of this study was on the eating out practices of the population of Ukraine. - Eating out – dining and drinks` consumption outside the home in a restaurant, cafe, bar, canteen, etc. - Food delivery – ready-made food that is delivered by request. Note, that data were collected in winter, and the eating out processes are dependent on the season`s change. The major facts about the eating outside the home practices of the residents of Ukraine. 30.1% of the adult population of Ukraine over the past 30 days ate food that was prepared outside their homes. This index has not changed much since the last year. The younger are people, the more often they eat outside the home. Among those younger than 30 years, 55% eat out; in the age group 30-39 y.o. they are 45%; in the age group of 40-49 y.o. - 33%, and then with the age increase this share is rapidly falling. Men up to 40 years old are 1.4 times more likely to eat out-of-home than women of the same age. 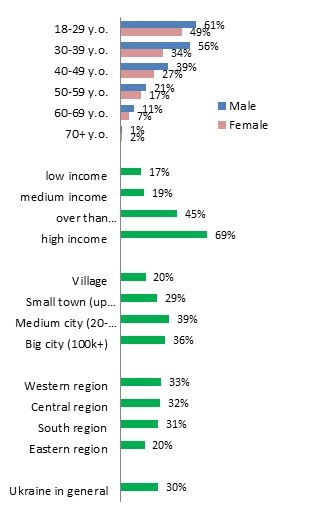 While in the villages one in five eats out of the home, in the medium-sized and big cities more than one-third of the adult population does this. The share of those who eat out is approximately the same in the Western, Central and Southern regions (31-33%), and among the residents of the Eastern region, it is significantly lower (20%). Residents of Ukraine prefer "democratic" catering establishments. Leaders include cafes or bistros, which account for 40% of all recent visits. Also popular are pizzerias (18%), coffee shops (17%) and the purchase of ready-made food in street kiosks/food counters (17%). Eating out of the home is distributed unevenly throughout the day. Most such cases occur during the lunch or in the form of snacks during the day. During the month, 14% of all interviewed dined outside the home, and another 13% had snacks or drinks during the day. A little less (7%) refused to cook dinner at home. The least popular meals outside homes are breakfasts since only 4% of the respondents reported that they had breakfast outside the house over the last month. 1. Have you personally eaten the food that had been cooked outside the home over the past 30 days? What is considered to be food and drinks prepared outside the home?- Eating out – dining and drinks` consumption outside the home in a restaurant, cafe, bar, canteen, etc.- Take away food/drinks to go – buying the ready-made food in café, supermarkets, from street vendors and in other places (at work, at home, on the street etc. );- Food delivery – ready-made food that is delivered by request. 3. Where did you buy that foods/drinks over the past 30 days? Mark all the options that suit.